I got on a journey called Shikoku Pilgrimage (Junrei). This is a journey around 88 temples in Shikoku Region (Island composed of 4 prefectures) and Koyasan in Wakayama Prefecture, they are related to Buddhist monk Kukai (Kobo Daishi) who existed about 1,200 years ago. Shikoku Pilgrimage has been done for ascetic exercises and faith since about 500 years ago, but recently there are many tourists and foreigners. The total distance is about 1,300 km, and there are various people who walk, use bicycles, cars and buses. The pilgrimage is taking place in various countries, and Shikoku Pilgrimage is similar to the pilgrimage of Spain (Camino de Santiago) in Christianity. We visit the Buddhist temples, but there are no restrictions on the qualifications of pilgrims and their purpose, and you can do your own purpose (faith, atonement, confession, ascetic exercises) away from your daily life. Mercury, mercury sulfide and copper mines were located in Shikoku related to Kukai. Mercury was used for gold plating by the amalgam method on the surface of bronze Buddha statue. Mercury sulfide is a red color and it was a precious substance used for painting shrines and temples. For this reason it is said that Kukai had knowledge of minerals. Besshi copper mine which was the world's largest output was in Shikoku. Although it is closed now, it became a sightseeing spot called Maintopia Besshi. You can visit mine facilities and experience gold panning. 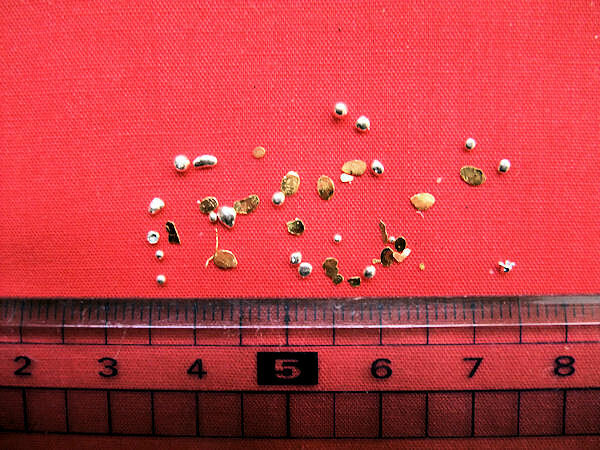 Foil gold and granular silver are included in the sand and it is difficult to separate. 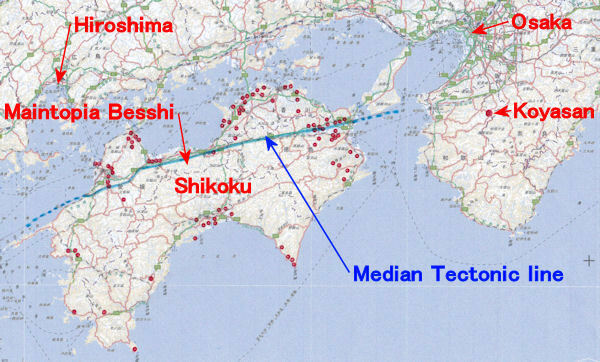 The red dot shows 88 temples, the blue line shows Median Tectonic Line(large fault). Pilgrims usually have a cape, white coat, cane, but there are no rules on clothes. The train used in the mine.